Either sit in a chair or stand distributing your weight evenly on both feet. Gently bend you head down, bringing your chin toward your chest. 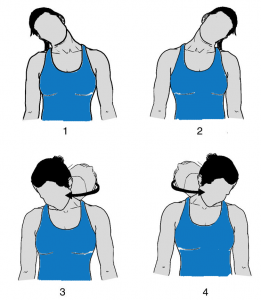 Roll your head to the right so that your ear is over your shoulder (Fig 1). Hold this position for 5 seconds. Gently roll your head back toward your chest and to the left. Turn your head so that your ear is over your left shoulder (Fig 2). Hold for 5 seconds. Move onto your arms, round your shoulders and allow your low back to drop toward the floor. Hold for 5 seconds. Move backward and sit on your buttocks close to your heels. Extend your arms and hold for 5 seconds. Sit on the floor with both legs spread straight in front of you. Cross one leg over the other. Slowly twist toward your bent leg, and support with your hand behind you. 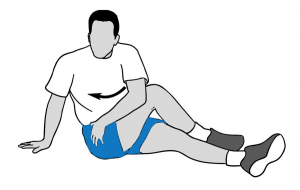 Place your other arm on the side of your bent thigh and use it twist further. Look over your shoulder and hold the stretch for 30 seconds. Come back to center. Keep your back straight and bend from your hips toward the foot of your straight leg. Reach your hands toward your toes of the extended leg, and hold for 5 seconds. Gradually round your spine and bring your hands to your shin or ankle. Bring your head down close to your knee as far as possible. Lie with your back on the floor. Lift one leg and bring your knee toward your chest. Grasp your knee or shin and pull your leg in as far as possible. Tighten your abdominals, pressing your spine to the floor. Hold for 5 seconds. Repeat on the other side. Then pull both legs in together. Repeat the sequence 10 times. Begin with your hands and knees, positioning your shoulders over your hands and your hips right over your knees. Tighten your abdominal muscles and raise one arm straight out to the shoulder level in alignment with your body. Hold until you feel balanced. Tighten the muscles of your buttocks and thigh, holding this position for 15 seconds. Return to the start position and repeat with the other arm and leg. Tightening your abdominal muscles, lift your hips off the floor. Keep your body straight and hold for 30 seconds. 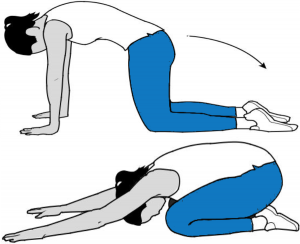 If find it difficult to hold this position, bring your knees back to the floor. Hold with just your hips lifted. Return to the start position and rest 30 seconds. Repeat. Lie on your side on a firm surface, with your bottom leg slightly bent and top leg straight. Bring your elbow directly under your shoulder, with your forearm extended in front of you. 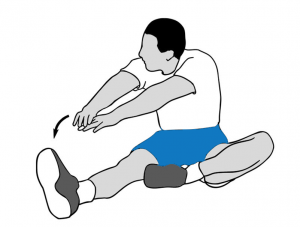 If you can, straighten your bottom leg and lift your knee off the floor. Keep your body straight holding it in this position for 15 seconds. Gradually return to the start position and repeat on the other side. our shoulders to your knees. Gradually return to the start position and repeat. 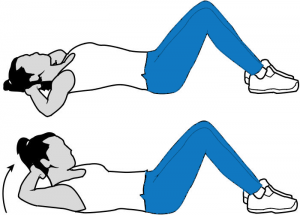 Tighten your abdominal muscles so that your stomach is pulled in, away from your waistband. Keep your back flat on the floor and hold for 2 seconds.